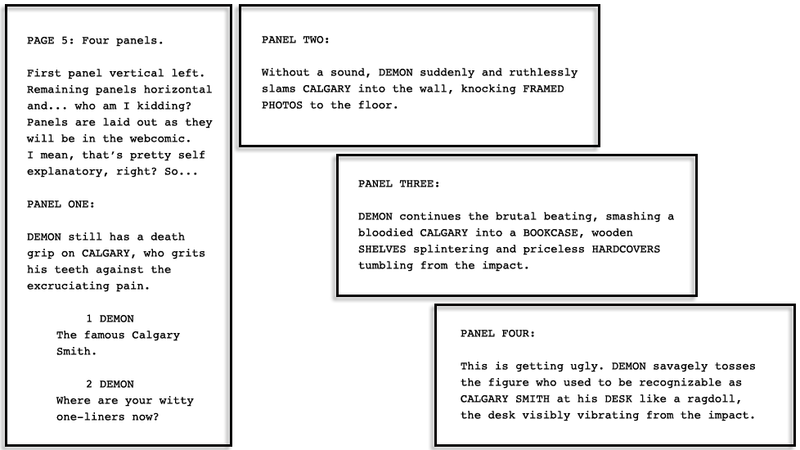 Perhaps not as epic as the Hulk beating up Loki (“Puny god!”), but Demon’s beat down of Calgary is pretty ugly. A phrase known as contradictio in terminis, or more colloquially an oxymoron or simply a contradiction in terms. Other examples? How about such oxymora as jumbo shrimp, airline food or in my experience, an Amtrak schedule. What can I say? Words are my thing. How can I not get distracted by cool latin phrases and little known plurals? My point, and I did have a point, is that this page is supposed to be hard to look at. This is as savage a beating as one is likely to ever witness. And unlike Loki, Calgary is not a god. At least not physically. Oh, and the above awesomely animated GIF was lovingly taken from Reaction GIFs. So about those page and panel layout descriptions. I am guessing everyone is getting as bored of them as I am. Especially since we’ve seen most of the page layouts numerous times in the past however many months. So to streamline the process and to give myself more space to describe the contents within each panel, I am hereby retiring page layout descriptions. Requiescat in pace. That’s all she wrote.